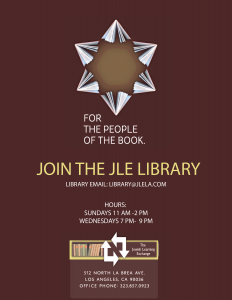 The JLE Library is a community project hosted at the Jewish Learning Exchange. We have hundreds of books covering a variety of topics: Jewish Laws & Customs, Talmud, Torah study, Biographies, Spirituality, Self-Improvement, Inspiring Stories, Fiction & Non-Fiction, Jewish novels, a wonderful Children’s section and much more! Please feel free to call or stop by with any specific requests. The library is open Sunday mornings from 11am – 2pm and on Wednesday evenings from 7pm-9pm. Our librarian Sally is here to help you with all your reading needs. In order to check out books, a valid library card is required. To apply for a library card, please download and fill the Library Card Application Form and bring it into the library. Individual memberships are $26 and a family membership is $54 and must be renewed annually.